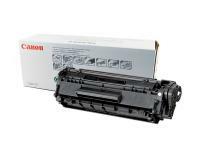 When do I Replace a Toner Cartridge in the Canon imageCLASS MF4690? 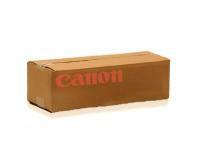 The lifespan of the toner cartridge installed in your Canon imageCLASS MF4690 is approx. 1,000 pages at 5% coverage, if the installed cartridge is from the ‘’Starter’’ type, or 2,000 pages at 5% coverage, if your printer is equipped with a standard toner cartridge. The actual lifespan of the installed toner cartridge depends mainly upon the type of the printed documents (graphics, tables, charts, etc…). Please note that you can extend the useful life of the installed toner cartridge by using the ‘’Toner Saver’’ mode. 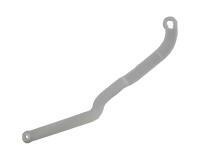 You can check the toner level of the installed toner cartridge at any time by pressing the [Toner Gauge] key. Please note that you should replace the toner cartridge, if its current toner level is 10 or less percentages. 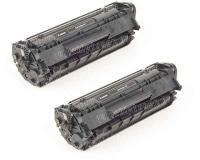 One of the listed print quality issues or warning messages will appear, when a new toner cartridge must be installed. ‘’TONER LOW <> PREPARE NEW TONER’’ – The installed toner cartridge is near the end of its useful life. You must install a new toner cartridge soon. Otherwise, the print quality will be gradually decreasing, until the printer switches to a non-operational mode caused by a completely exhausted toner cartridge. The overall print quality is poor – You must make sure that the correct type of paper is loaded, and the toner saver mode is off. 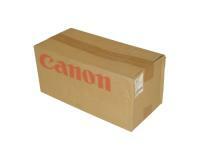 A new toner cartridge must be installed, if the print quality remains unsatisfactory. Partial/incomplete prints/copies/faxes – You must make sure that the paper guides of the cassette are set to the correct size. 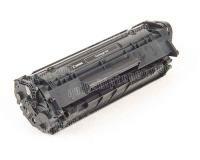 The toner cartridge must be replaced, if the problem persists. 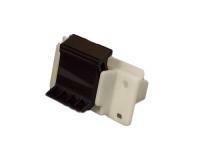 Blank copies/prints/faxes – The most common cause for this issue is an incorrect installation of the toner cartridge. Herein, you must make sure that the plastic seal has been removed from the installed toner cartridge, and then insert the cartridge firmly into the slot. Please install a new toner cartridge, if the issue persists. Light/faded copies or uneven density – The installed toner cartridge is nearly empty. 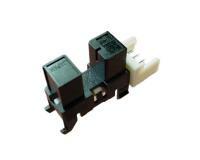 You should install a new toner cartridge to resolve the issue. The copies/printouts have vertical white streaks – The installed toner cartridge is near the end of its useful life. Please install a new toner cartridge. It is always better if you keep a spare toner cartridge for your Canon imageCLASS MF4690 in stock, but please do not open the protective bag until you are ready to install the toner cartridge. To install a new toner cartridge in your Canon imageCLASS MF4690, you must open the scanning unit, and then open the toner cover by pulling its handle upwards. After that, you must pull the used toner cartridge out of the laser printer, and then unpack the new toner cartridge. Now, you must redistribute the toner by gently rocking the new cartridge seven-eight times from side to side, and then remove the protective sealing tape. In the next step of the installation, you must align the protrusions of the new toner cartridge with the guides of the compartment, and then insert the new cartridge completely into the machine. Once the new toner cartridge is firmly inserted, you must close the toner cover, and then lower the scanning unit. Finally, you must clean the fuser roller by executing the short cleaning procedure included below. 1. 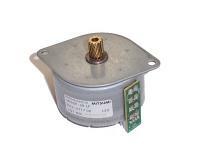 Press the [Additional Functions] button, and then select ‘’ADJUST. /CLEANING’’.